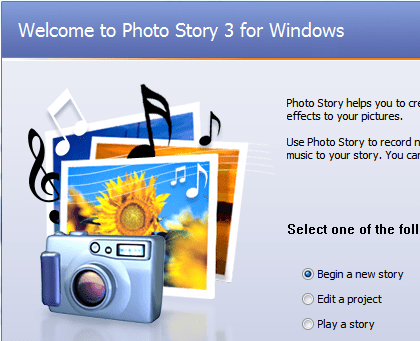 Photo Story 3 is a free program from Microsoft. It has been around since Windows XP. We have been using Photo Story 3 to easily create great slideshows with movement, transitions, narration, and music. It is the best free program we have found that does all that. It is also one of the easiest programs we teach about. What it doesn’t do is work with video clips. For that we teach Movie Maker. But Movie Maker can’t make music. Photo Story can actually create music on the fly. This article shows you how to create the music in Photo Story for use in a completed video made with Movie Maker. I was worried when the installation on my Windows 8 computer failed. Now, with the update to Windows 8.1 it works! I thought we would have to stop teaching it. The program walks you through the entire process of creating a slideshow. We have a complete Learning Library set of Tutorial Videos on how to use Photo Story 3. The end result is a .WMV file, Windows Media Video. That format can be incorporated into a Movie Maker project as a video clip, or for this example, Photo Story is used to create the music for your Movie Maker music track. Music enhances any video project. Problems can arise if you use copyrighted music and want to upload the video to the web. Video sharing sites like YouTube will not allow that. You can find copyright-free music on the web, but it is a lot of fun to create your own music. I have a Movie Maker project with a few still pictures and several video clips. The entire project is 5 minutes in length. I want to add a music soundtrack. You can learn how to use Movie Maker using our Tutorial Videos. I begin a new story and import a single picture. It doesn’t really matter what picture, because it will not be part of the end result. When you click Next>, you can put a title on your picture. You might want to do that to identify it as a music file, but you don’t have to. Click Next and you will be on the screen to Customize Motion and add narration. This is the key screen to creating music of the proper length for your soundtrack. Click the Customize Motion button under the picture. You will get another screen where you will set the number of seconds to display the picture. A minute is 60 seconds, so a 5 minute sound track is going to be 5 X 60 = 300 seconds. Set the number of seconds to the desired length of your soundtrack. Now you can create the music for your soundtrack. Get ready for some fun. 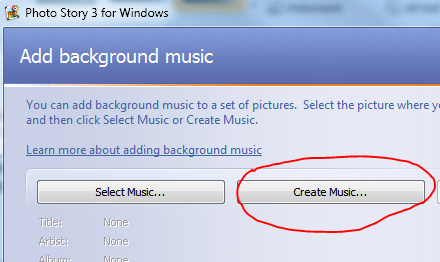 Click the Create Music… button. 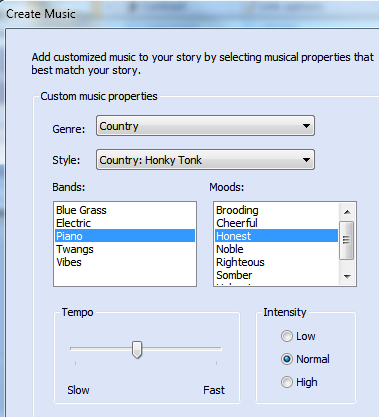 You will be presented with a screen to choose a Genre, Styles, Instruments, Moods, Tempo, and Intensity. You can preview your choices until you are satisfied. I will warn you, this can keep you entertained for hours! Use the dropdowns to choose your music. Mix and match until you achieve your desired sound using the Play button. You can even change some settings while the music is playing. You want to choose music that is appropriate to your Movie Maker project. Choose a filename and the location on your computer where you want it to go. I recommend saving it with the Movie Maker project. Use a descriptive filename. When you click Next, Photo Story 3 will build your story and generate the custom music you created. The end result will be a .WMV file in your project folder. Now you can open your Movie Maker project and choose Add Music. Find the .WMV file you created with Photo Story 3. It is best to show “all files” to find it. It will automatically be imported to the music track of your movie. Congratulations. You now have a music soundtrack for your Movie Maker project! In the following example, Photo Story was used to create the first 33 seconds … the still pictures with transition and music. Then Movie Maker was used to combine that 33 second slideshow with 4 minutes of video and the music created by Photo Story. A third piece of music was created for the credits! It’s really not hard … the tutorial videos will show you how to do it all. Published by MrsGeek, in Blog. Tagged with Copyright Free Music, Movie Maker, photo story 3. What a wonderful video! Who ever thought of using the audio from Photo Story and adding it into Movie Maker. A genius idea and you both did a wonderful job. A project you can be very proud of.